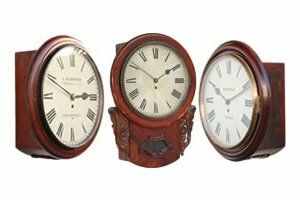 We specialize in British and American antique clocks. 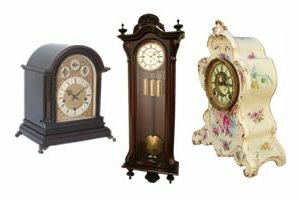 We have a large selection of dial, wall, mantle, and grandfather clocks. We are the number one dealer in the US for American and British clocks. With over a decade of performing clock repair, TickTockTony has the expertise required to ensure that your clock gets the attention it needs. All of our antique clocks were hand-built by master clock-smiths. Unlike other websites, most of our antique clocks are a couple of hundred years old. Antique clocks use a simple and robust movement hand-built by master clock-smiths. This results in a reliable clock movement that runs for hundreds of years. With the appropriate maintenance it will run for the next hundred years. This antique is a fine quality long case clock by Henry Daniel of London. It is an eight-day anchor escapement movement and strikes the hour on an English bell. The clock has a silvered dial that has a strike silent leaver in the arch and blued steel hands. The case is flame mahogany with a break arch hood. The three finials are set on blocks with a scalloped separator. 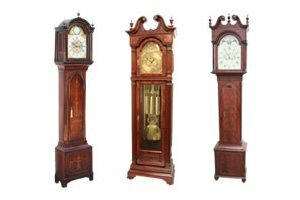 Antique clocks are not just pieces of furniture or timepieces; they are a sound investment, a piece of history, a work of art, and a very old antique. On the other hand, If you purchase a modern clock, the movement will fail in about thirty years. Modern movements just don't last as long as an antique movements. If you purchased an antique clock five years ago, today it would be worth more than what you paid for it. Whereas, a modern clock would only be worth a fraction of its original price. With our volatile economy antique clocks may be a better investment than your 401k. An antique clock is a wise investment because it appreciates over time. When it comes time to pass it onto future generations, your antique clock will be worth more then when you purchased it. We perform repairs, overhauls, and preventive maintenance on both antique and modern grandfather, wall, dial, cuckoo, and mantle clocks. If your clock is not working, or it is not keeping accurate time, contact us and let us advise you. In Southern California, where we are located, we offer house calls to provide simple repairs and maintenance -- or to pick up your valuable clock. TickTockTony is an authorized clock repair service center for Howard Miller, Ridgeway clocks, and Sligh Clocks. In California we have become the number one dealer for British clock repairs. We carefully inspect your clock before and after we service it. Of course, we provide a one year warranty on clock movements that we overhaul. TickTockTony has several tutorials aimed at better informing you about Antique Clock repair. We are constantly adding more tutorials so please check back if you don't find one of interest. Each tutorial contains clock repair tips, interesting explanations, as well as clock cleaning products. Whether you are a collector of antique clocks, or just enjoy the beauty of a well made clock, you are sure to enjoy reading the tutorials and watching the repair videos. Currently, we have videos showing you how to wind-up antique clocks, how to remove the movement from the clock case, and explanations of how the movement works. Additionally, we have more videos uploaded on our YouTube channel. If you have an idea for a tutorial, please feel free to contact us. Basically, an overhaul focuses on the entire clock movement, whereas a repair focuses on a particular issue. Not all clocks are in need of an overhaul. In fact, most clocks require only a minor repair. After inspecting your clock's movement, we will recommend the repairs needed and advise you if the movement would benefit from an overhaul. When we perform our 11-step overhaul, we completely disassemble the movement and perform a rigorous inspection. A strong indicator that a movement needs an overhaul, instead of a minor clock repair, is when the oil sinks contain a black or green residue. The residue is a mixture of brass powder and old oil. When the residue is visible it is a sure sign your clock needs a rebushing. We recommend a clock oiling be performed every two years. Having your antique clocks oiled regularly helps make certain it will last for future generations.